“Whether I knew it or not,” he says. 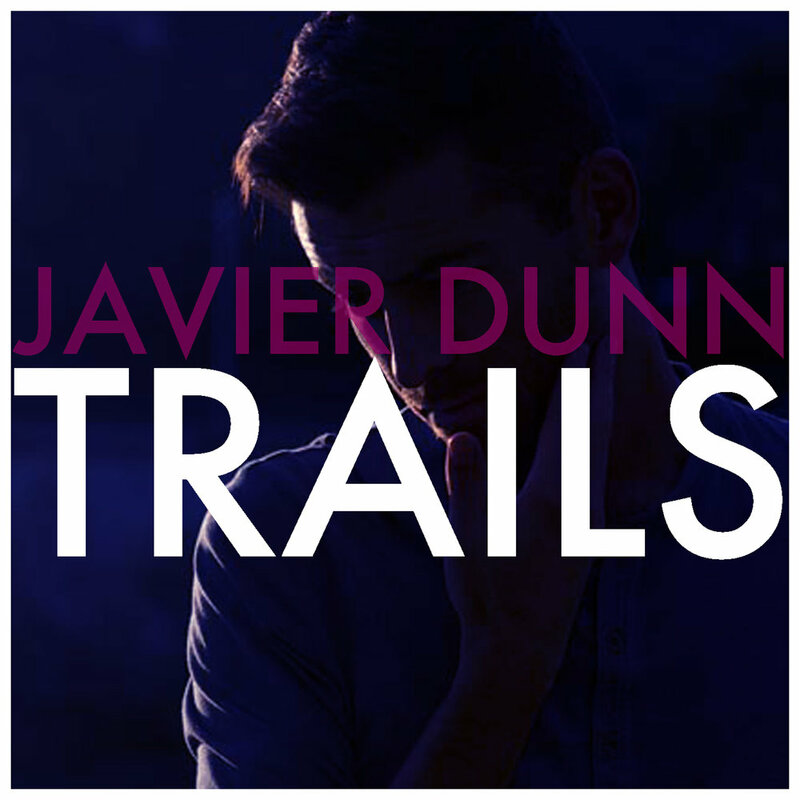 “I was making an album that deals with change, loss, falling in and out of love, insecurity, youth and hope,” Dunn says of his debut album “Trails.” Javier was writing songs about life as he was living it, “And maybe the title TRAILS comes from that too, somehow. Trails are any set of markers or memories that lead you somewhere, or back from the place you came. Signals to follow. It could be sights or sounds.” For Javier, these songs are both a look back, and his trail forward with nods to his influences that range from Prince to Eric Clapton, Sting, Bonnie Raitt, Kanye West and Miles Davis. Javier has always had eclectic musical tastes and an affinity for computers and technology, but it wasn’t until a few years ago that the technology caught up to the songs and sounds that Javier would hear in his head. “the quality of sample sounds is sooo much better today than it was 10 years ago when i started recording on computers,” says Javier “i always heard songs and sounds in my brain that were so much more than just guitar, but never really felt like i could recreate them to my satisfaction given the technology.”Musically, TRAILS veers off the path Javier had forged with his previous material. “I stopped censoring myself,” he confesses. “I didn't judge the song or the sound or the idea and just made the things that were in my brain. 6 songs came out in 2 weeks, and they formed the basis for the album. It was the beat-driven synth thing, but with guitars and instruments, and a singer-songwriter ‘voice’ still being vulnerable and hopefully honest through it all.”Javier Dunn began his music career playing open mics and small clubs in the San Francisco Bay Area, and at 17 he moved to Los Angeles. “It was only after I moved to LA that I realized how vital that move was,” says Javier. “Meeting other musicians. Being around people achieving the goals I wanted to achieve. My tribe and inspiration.”While attending UCLA, Javier gigged as a solo artist and as a bass and guitar player in several jazz, funk, rap and rock groups. He also began experimenting with recording, programming and producing.Shortly after college, he met Sara Bareilles, a then-unknown singer-songwriter. The pair became fast friends, and he would go on to tour as her guitarist for the next 8 years. Javier co-wrote "Love on the Rocks" with Sara, from her platinum- selling debut Little Voice.In between touring cycles, and even while on the road, Javier wrote, recorded, produced and distributed 4 EPs, 2 singles, and 1 full album. His songs have earned the admiration of music fans all over the world and have received numerous placements on networks such as MTV, the CW, FX and ABC, as wellas several feature films.After going it alone for years, Javier signed with Red Parade Music, the music group helmed by Los Angeles based producer Jim Roach, in the summer of 2012 and quickly went to work making TRAILS, his debut album with the label. Javier plays all the instruments on the record, with Jim Roach at the helm and Sara Bareilles lending her vocals to a few songs.Javier’s songwriting process is one of discovery, where lyrics are uncovered. “All songwriters are really just miners. Hunters,” he explains. “Hoping to find the thing that they know they are looking for, but don't really know where or how to look. You just dig because you know it's there somewhere.”“Couple of Drinks,” the lead off track on TRAILS, was written during a 4th of July party, and is one such honest track. Javier admits, “I was newly single and feeling very weird about the whole idea of flirting and being social. I observed all the different conversations going on and thought about how we all do the same things. I was floating in a pool, and something about floating opens your mind to creativity, and the whole melody and chorus came to me in an instant. I memorized it there in the pool, went home that night, and wrote the song.”TRAILS is a synthetic, beat driven and cosmopolitan experience where hip hop, electronic and eclectic elements converge.